A pioneer of large-scale sound reinforcement, including systems for the Beatles, the Filmore, and Woodstock, reflects on the early years of rock and roll. From the January 1989 issue of the late, great Recording Engineer/Producer (RE/P) magazine, Barry McKinnon interviews a pioneer of our industry. Every industry has its pioneers, those individuals who took the first stab at a field no one else considered or wanted to try, and the sound reinforcement industry is no different. Bill Hanley has been in the mobile sound reinforcement business for more than 30 years and has been involved with major artists and events such as the Beatles and Woodstock. He began all of this when off-the-shelf products for large-scale sound reinforcement were not available, and innovation and adaptation were necessities. Hanley’s interest in audio began in high school, oddly enough, through his interest in roller skating. The roller rink where he spent so much time had an incredible organ sound system and great acoustics. In his early teens, he studied radio, television and electronics, which led to his interest in the hardware being used in the rink. The 400W sound system, combined with the energetic playing style of the organist, contributed to the enjoyment that the patrons of the rink felt. “I fell in love with big high-fidelity sound, on a big scale for concerts; I found a lot of joy and happiness in it,” Hanley said. In 1952, he started doing school record hops, and then in 1954, started Hanley Sound with his brother Terry. Bill and Terry did some work for the Boston Arts Festival and ended up buying a system from them. His next project was to get that system into the Newport Jazz Festival when the film “High Society” came out, as the festival became a bigger event after being exposed to the mass audience of the film. Soon afterward, he purchased another system from an electrical engineer in New York. 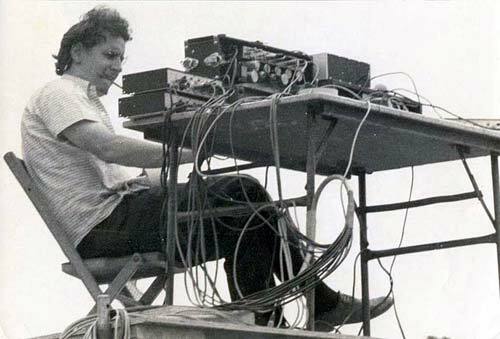 He had been mixing the live sound at Newport since 1960 and then took over the live recording in 1962 -1963 to help alleviate the forest of microphones that had been growing on the stage. In the early 1960s, Hanley began providing the house sound for Madison Square Garden as well. “The road shows would come in and throw up a system on stage, and that would be it:” The promoter was paying thousands of dollars in labor for the electricians, and Hanley was getting $500 to $800 per night. “They didn’t have a great foreman, and I wasn’t a great foreman either, so that was part of the problem. They just didn’t understand the business:’ He continued for three or four years until he was putting so much gear in there, he was losing money. His drive to put up the best sound system possible, no matter what, led to some philosophical shocks. Bill was traveling with George Wiens’ Jazz Festival, bringing high-fidelity sound to stadiums and fields in Chicago, Cincinnati, and Cleveland, when his search for larger shows led to his involvement with the Beatles. The Beatles’ system consisted of 12 Altec 210 low -frequency enclosures and Altec 203B two -cell multicells with 290 drivers. The 288 drivers had better high-frequency response but “a 288 didn’t last the night. We were using the 290s, even though the 40 voice coils were an inconvenience,” said Hanley. The mixing console was a custom-built unit, using 16 channels of Langevin modules. The Beatles marked a turning point in sound reinforcement in Hanley’s view. Hanley was doing permanent gigs for three years at the Filmore in San Francisco, from its opening in 1967, again using the Altec 210s and 203 and 1003 multicells with 290 drivers, set up with left and right stacks downstairs and a counter-weighted center cluster, with four of the 210s in it, hung 4 or 5 feet out in front of the proscenium. He used a custom 20-input console, again made up of Langevin AM16 preamps and featuring EQ on every input. This fed the system through LA2A limiters into passive low -level crossovers and then into Macintosh MI-200 amplifiers. “In 1965 or 1966, we began bi-amping because we started to use so much power that we blew up the capacitors in the passive networks. They’d begin making some real strange sounds, then – Bang! – nothing. Hanley’s views were shaken up by two experiences, the first being exposure to Grand Funk Railroad. They had a sound man out of Detroit who had assembled a system using Electro-Voice full -range speaker systems assembled into boxes, augmented by bass speakers. “Grand Funk shows up at Randall Island, with this kid and his boxes and a pile of DC300 Crowns and associated stuff and sets up beside my system. We didn’t ‘A-B’ them, he just set up and when the band came out he turned it on. Christ, was it loud – distorted, but loud. Here I was, proud of my fidelity, but I stood in the audience and listened to it and realized it was a valid experience – distortion! “It was valid for what the band wanted for their audience. Up to that time I had been successful in promoting fidelity, but who was I to superimpose my values on their music? I really had to scratch my head and wonder how much money to spend on fidelity. Here was this kid with his system full of $28.50 EV horns, and piles of them, two or three hundred of them. He got heavy bass out of his bass cabinets and had incredibly efficient output, and it was a valid experience. “The bands weren’t hiring me, they were booting me out of jobs because it wasn’t what they wanted. They were getting into this distortion thing; everybody was loving it. Grand Funk was the top group in the country at the time. If they didn’t want to hire me, I had to alter my thinking. Very interesting. I wish I was there with Bill learning from experience. I always wondered how the sound sounded in those days and what equipment they used. I would like to know at what point did Bill phase out the tube amps as transistor amps became more reliable.